Please note: Your purchase will not be shipped until shipping details are arranged and shpping price is agreed by both parties. To inquire about shipping cost please contact us. Liz was born and raised in Williams Lake, BC. Her father, Lee Skipp, was a Williams Lake lawyer, then a Vancouver County Court judge and Supreme Court Justice before retirement. Her mother, Mary (nee Latin), was born in Williams Lake. Liz has two brothers, Jim and Matt Skipp. Liz attended school in Williams Lake, where she graduated as an Honour Roll student and an athelete in multiple sports. After graduation in 1974, she moved to North Vancouver attending Capilano College and UBC studying English, History, Political Science and Fine Arts. Each summer, Liz returned to Williams Lake to work during the school break and it was there, in the summer of 1977 that she met her future husband, Bronc Twan. They now have two sons, Willee and Jesse, who are still very involved in the Alkali Lake Ranch today. She has maintained an interest in writing, history and photography since her boys were little. 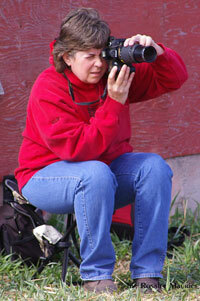 She is a self taught photographer who loves cowboys and cowgirls and the life they embrace. Her photographs show the vision of an artist who clearly is at one with the environment around her. Virtually none of her photographs are 'posed for.' She considers it a privilege to pursue her love of photography and history at home. Liz writes for several publications, including The Williams Lake Tribune, Beef in BC, Country Life and Canadian Cowboy Country. Many of her photographs have been featured in these publications and on TV spots. Liz self -published her first book in 2008; a collection of short, true stories and photographs titled: "Cowboys, Characters and Critters; The Life of the British Columbia Cowboy". Liz and Bronc are very involved in the Williams Lake Stampede, Bronc as a competitor and both as volunteers. They were recently awarded Lifetime Passes to the Stampede. Liz has been very supportive in my framing of her works. I strive for unique presentations with the unusual treatments the photos themselves invite. Her work inspires me and begs me to be creative. We make a good team, Liz and me. My treatments of her hand signed photographs, which she mostly prints herself, include the use of suede and fabric float mats, with special embroidery thread lines. I also incorporate hand painted watercolor lines on paper mats. Some of the photos are intentionally offset to create a movement paralleling the flow of the images. I will use a uv laminate on some pieces that defy the use of glazing and I drymount and trim the photo on a bevel to expose colored substrates. The non glazed pieces will have the fabric or suede float mat and any paper mat will have been sprayed for protection. Most photos behind a mat opening will have been recessed with mat lifts for special effect. Only the best materials are selected and great care is used when adhering the floated photos, for longevity and safety. All floated framings are recessed in the frame, for effect or to keep any glazing from touching the print.All types of glazing are available, from the recommended UV protection in clear and Museum glass to Anti Reflective glazing. I don’t usually recommend Non Glare or Reflection Control because of their blurring of the image. But I will happily offer advice on the best glazing for the picture in hand. 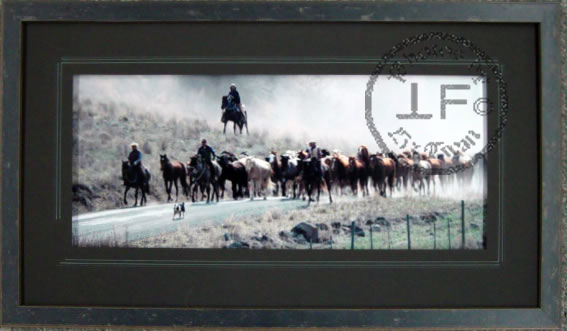 The images themselves are available in any size and can be framed with many treatments. I am happy to confer with clients and photograph and email samples recommended. As I am a creative individual, most often there are subtle changes during the proscribed framing process as I am always open to internal interpretation of the design until the day I finish it. The presentation will be exactly what it needs to be. An artist friend of mine once gave me the quote “A painting is never finished, it just stops in interesting places.” and I sometimes find it handy to remember, in framing and in my own artistic endeavors. No extra charges ever occur beyond the quote if the design moves away from the initial concept. While I invite people to come and enjoy Liz’s photography in my gallery and perhaps take one home, I understand prospective buyers from afar have to take great leaps of faith to purchase and not be disappointed when the package is opened. With my clients, I give them my guarantee and state that I do not stand behind my framing, I stand underneath it. Seriously, I am an accomplished framer and cannot countenance sending out anything below my standards, which, after 30 years in framing, have risen mightily and confidently. Shipping costs will of course vary depending on size, weight, glazing or none and destination. I am familiar with proper packaging for any continent and because these images are replaceable, insurance will readily compensate all involved, should the unthinkable happen. Shipping quotes are available upon request. Thank you for viewing Liz’ work and I hope something speaks to you. Honest portrayal of a way of life can be uplifting for the human spirit.